The Mercedes concept: Long hood, flowing lines, “boat tail” rear. Mercedes-Benz showed its view of an ultraluxury convertible of the future with its Vision Mercedes-Maybach 6 Cabriolet unveiled last week in Pebble Beach, California. The art deco-inspired two-seater is a follow-up to the Vision Mercedes-Maybach 6 Coupe shown a year ago at the same Monterey Car Week event. The cars don't tease a coming production vehicle but are instead meant to showcase Mercedes' design vision for the Maybach subbrand. 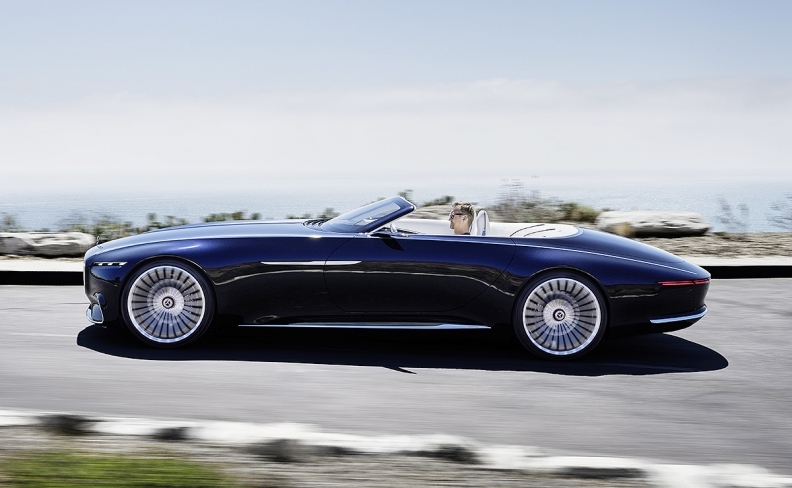 "The Vision Mercedes-Maybach 6 Cabriolet takes modern luxury into the realms of the ultimate in luxury, and is the perfect embodiment of our design strategy," Gorden Wagener, Daimler chief design officer, said in a statement. "Breathtaking proportions combined with a luxurious 'haute couture' interior help to create the ultimate experience." The concept measures nearly 20 feet in length and includes a super-long hood, flowing lines and an extended, round "boat tail" rear reminiscent of a luxury yacht. The future also is previewed in the concept's powertrain. The Vision Mercedes-Maybach 6 Cabriolet is designed as an electric car with output of 750 hp and range of more than 200 miles. It would accelerate from 0 to 60 mph in less than 4 seconds, Mercedes says. A quick-charge feature allows for enough power to be recharged in five minutes to boost range by around 60 miles.